First published in 1970, this book considers the alleged distinction between ‘education for life’ and ‘education for work’ and exposes the fallacies on which this and other similar distinctions are based. It shows that ideas on this subject are inextricably intertwined with wider views on the nature of culture, the limits of individual educability and the provision of educational opportunities. 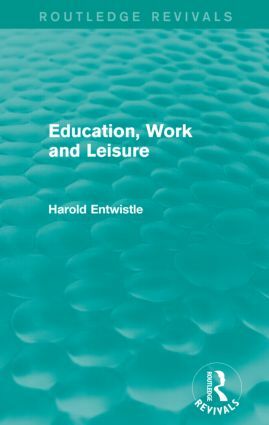 Indeed, Dr Entwistle argues that students need to be well informed of these issues in order to be in a strong enough position to face problems of education and social development that will occur during their working lives. Education: for Living or Earning a Living?